The Shenzhou VI Manned Space Mission delegation was warmly greeted by some 40,000 Hong Kong citizens with national flags and flags of the Hong Kong Special Administrative Region (HKSAR) in Hong Kong Stadium on Sunday afternoon. The 30-strong delegation, including astronauts Fei Junlong and Nie Haisheng and leading engineers of the space mission, had arrived in Hong Kong earlier in the day at the invitation of Hong Kong Chief Executive Donald Tsang. The Variety Show for Welcoming the Delegation of Shenzhou VI Manned Space Mission, China's second manned space mission, began at about 3:10 PM (0710 GMT). When Fei Junlong and Nie Haisheng traveled around the stadium by a battery vehicle, Hong Kong citizens at the stadium all stood up in respect with flags and small balloons in hands. Chief Executive Donald Tsang said at the beginning of the show that Hong Kong was honored to welcome the delegation and he expressed respect for the national heroes on behalf of the HKSAR government and all Hong Kong citizens. He said the successful launching of the Shenzhou VI manned spacecraft advanced China's space dreams. 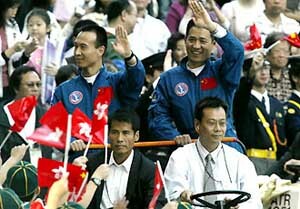 Hu Shixiang, deputy chief commander of China's manned space flight project, expressed his thanks for the warm welcome showed by Hong Kong compatriots and conveyed greetings from President Hu Jintao, Chairman of the Standing Committee of the National People's Congress Wu Bangguo and Premier Wen Jiabao. He said the gathering of over 40,000 Hong Kong compatriots at the variety show to celebrate the successful launching of the Shenzhou VI manned spacecraft showed Hong Kong compatriots' concern for the space undertaking of the motherland. Hu, on behalf of all personnel engaged in China's space industry, wished Hong Kong a more beautiful tomorrow and a more powerful and prosperous motherland. Hong Kong popular stars as Joey Yung, Leo Ku Kai Kei and Lisa Wong performed at the show. Dragon and lion dances were also staged. 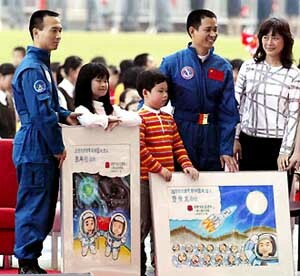 A special part of show was a dialogue between the two astronauts and six primary school students. Fei Junlong and Nie Haisheng first thanked the HKSAR government and Hong Kong citizens for their warm welcome. Fei said he was honored for having been selected to represent the nation in space. Nie said the most memorable moments of the mission for him were receiving greetings from the Chinese people, including Hong Kong people. They were the strongest driving force for completing the mission. Four Hong Kong students presented their paintings to the delegation. They were paintings of flying dragons representing the nation and China's planned future missions to the moon.